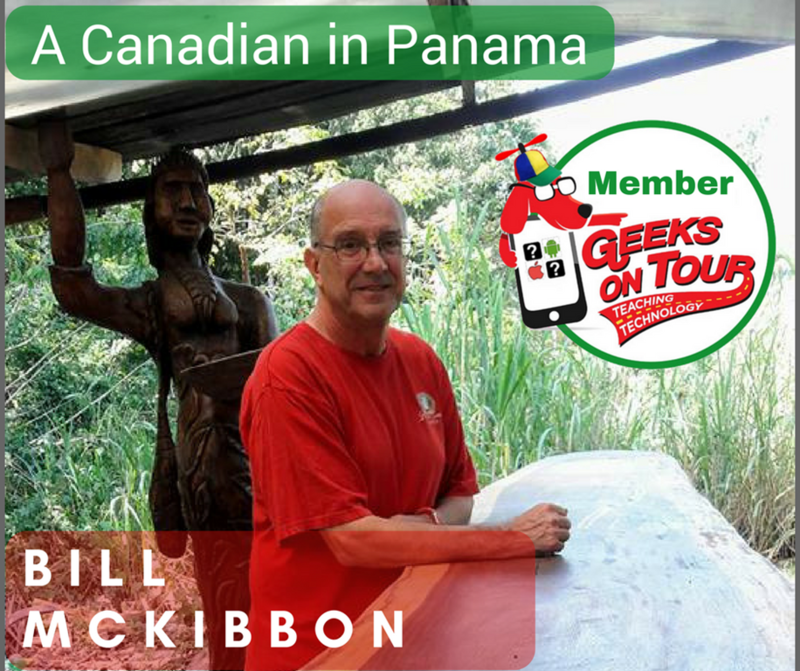 A Canadian who is now an ex-pat in Panama, Bill McKibbon has been an “early adopter” of technology and has used it in some very interesting ways since the late 1970’s. Below is my interview with him which reveals aspects of his adventurous life, his reasons for moving to Panama, and the ways he has used technology and benefited from his membership with the Geeks on Tour. Tell me about your background and work experience and how you got interested in technology. I was born and raised in Toronto Ontario Canada. I am a high school graduate. I was not at all interested in attending school beyond grade 12 and started work right away in the Transportation industry. I started out in the entry level position in the mail room. This was in the late 1970’s. There was one computer and a printer in the mail room, and it was connected to a computer at each branch office across North America. I remember stacks and stacks of computer punch cards, and the printer paper always jamming. I moved up through the ranks and eventually became a Branch Manager in a small town near our family cottage on Georgian Bay. I jumped at the opportunity to live year-round at the cottage and get away from Toronto. I retired from the transportation industry in 2001 accepting an early package because the company was downsizing and offering nice packages. I was 50 at the time. I then pursued my hobby of woodworking and turned it into a full-time home business producing quality outdoor furniture with sales around the world all from a website that I created with some web design software and a lot of luck with Google search placement. 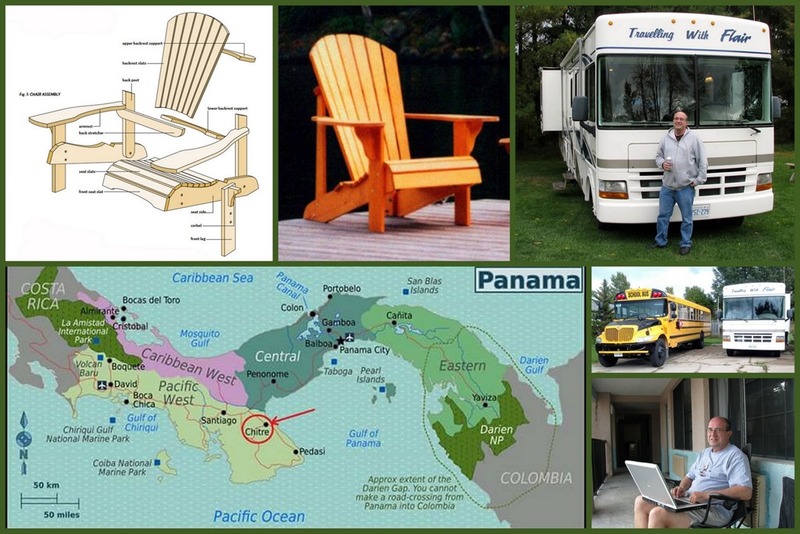 My site came up as number one on Google when you entered the key words Muskoka Chair which, in Canada, is the equivalent of the Adirondack Chair in the US. I think I was number 3 or 4 if the keyword search was Adirondack chair. I had sales all around the world because tourists would come and sit on this style of chair on their vacations in Ontario cottage country and wanted some of them for their decks back home in Germany, England, Sweden, USA, Australia or wherever they were from. Most of my sales went to the USA. I offered the chairs in a kit form, and all the parts were labeled for easy assembly by following the instructions. I also sold a lot on ebay during the early years back when you could get $100 for a piece of toast with the image of Jesus burnt into the toast. In 2003 I added School Bus Driver to my resume. It was the perfect part time job–a couple of hours in the morning and a couple of hours in the afternoon. My secret weapon for having some control over the high school students was offering them a wifi hotspot from my iPhone. I was the only bus in our county that offered that. The students understood that the wifi would be shut off if there was any nonsense in the bus. I had figured out their currency: they want wifi and would do what is necessary to keep the signal on. The other bus drivers thought I was out of my mind for paying for the data and offering it to the students. To me 80 dollars a month for an unlimited plan worked out to 4 dollars a day. I would gladly pay that anytime for a quiet bus. How and why did you decide to move to Panama? I visited Panama in October 2013 for my 60th birthday. One item on my bucket list was to see the Panama Canal. I guess the hook was set then, but I didn’t know it. I planned to retire for the second time when I turned 62, so I started to put the plan into motion. I knew to retire I needed to sell my house and get rid of absolutely everything. I digitized all my photos that were in albums and then got rid of absolutely everything I had accumulated. I wanted to be responsible only for me, a few weeks of clothing and my devices. I didn’t need or want anything else. Friends and family were convinced I was losing my mind when I told them that I had decided that I would live in a hotel for the rest of my life. The plan was six months in Canada and six months down south, anywhere down south was fine. The house sold quickly, so I lived in a hotel for almost two years before retiring. I really enjoyed it. No responsibility, no electric or cable bills, free wifi, free breakfasts and always the staff and new guests to talk with. I started pricing hotels in Florida and Texas thinking that was where I would spend my first winter. But in the back of my mind was Panama. I had spent a lot of years vacationing in México, but I didn’t want to go to México again. And Panamá kept calling me. I checked into some pricing. Realized it was easily 1/2 the price of a winter in FL or TX, I booked a stay and thought I would try various locations in Panama throughout the 6 months. I soon realized how much I liked the simple life here, the friendly people and the variety and diversity of the country. Every day was a new adventure or experience. I started to ask myself why limit myself to six months since I had no obligations to return to, no property to maintain, nothing drawing me to go back. The rest is history. I am soon going to complete my second year here and every day is still a new adventure or experience. I am never bored, have a great network of friends and, with thanks to great wifi, I can still be in touch with friends and family back home. How did you hear about the Geeks on Tour and what have you learned from them? I heard about The Geeks when I stumbled across them in a Google search I was doing to plan for my first major road trip along Route 66 in the summer of 2007. My job driving a school bus gave me two months off to do the trip. I bought a navigation program called Streets and Trips. I wanted to plan the two month trip, figure out what I wanted to see and where I wanted to be each day, figure out my hotel stays, lunch breaks, where to buy fuel and so on. The Geeks’ name came up in my search for questions that I had about the program. They responded to my questions. I saw they had a motorhome, and, although I didn’t have one yet, it was in the back of my mind that I wanted one. They were going to places I wanted to go to; they were using technology and smartphones just as I was; they are interested in photography and so am I. Our interests were and still are very similar. I have seen every episode of their weekly show, What Does This Button Do, and I am an early audience member every week. Several years ago I became a member. I believe in supporting their efforts because I like the style of teaching. Bite-size pieces is how I like to learn. I always come away learning something from them. What would you like to learn about technology going forward? Who can say what tomorrow’s technology will be, but I want to be on the cutting edge of whatever is next. I know that Chris and Jim will be there leading the way and answering any questions I might have. Perhaps the shoe will be on the other foot and I might be able to answer a question or tell them something they might not know yet. We are always learning. It keeps us young.